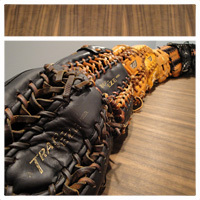 WWW.GLOVE-WORKS.COM BASEBALL GLOVE COLLECTOR FORUM • View topic - How well do you Horween? Can you tell what's what? How well do you Horween? Can you tell what's what? Post subject: Re: How well do you Horween? Can you tell what's what? Right, but even you referred to one of them as oiled horween and the other two as stock horween. Correct. One is oil tanned horween, with the classic stamp. The other two are the stock horween. I've seen your comparison picture on SBF with your custom and the TT's. The Color of your custom is closer to the TT's I had - almost J-Tan yellow like. I have a hard time believing the leathers are drastically different or one being better than the other. All of my tan horween gloves have different hues. Yeah, all the horweens I have owned have been different shades, but they have also been different ages.